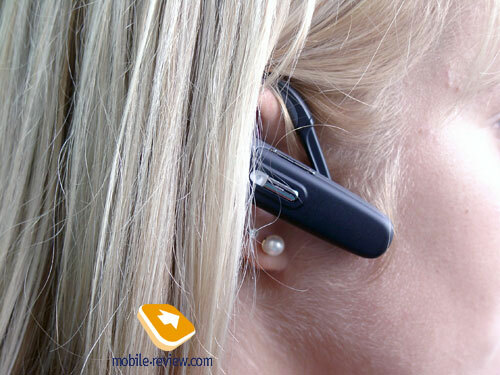 This headset comes from a broad class of devices which can be called typical market «players», following from the labeling of all new gadgets used in reviews over at Mobile-Review. Bluntly speaking, that stands for just another “nothing-special” offering with good quality/price ratio, targeting at the wide audience, in particular people looking not for a fashion-charged feature-packed solution. I can’t say the PV-705 lacks any fetching options on its spec list such as very portable size, for example, but that doesn’t make the headset stand out much on the shelves of retail stores. The headset’s design, to my thinking, is rather successful, as it will fit both office workers and sportsmen, except those keen on runs in heavy rain, so before purchasing do consider this point as well. The device was test-drove by several (8 persons: 3 men, 5 women) potential buyers and was taken mostly positively, but criticized for lacking any design specialties, which could really grab their attention. The PV-705’s small size doesn’t play any significant part, as the market has already seen headsets smaller and lighter in weight than the PV705. 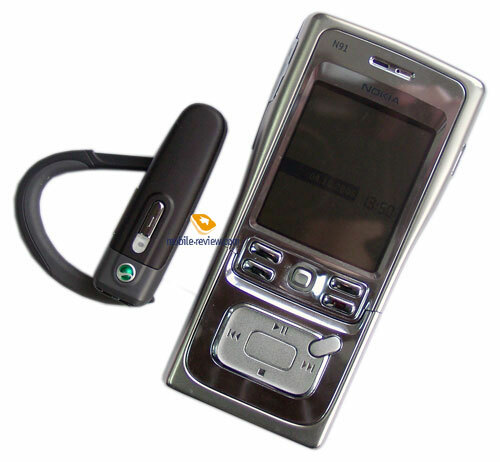 In the sense of other aspects, I repeat it one more time, there were no complaints, since Sony Ericsson knows how to produce headsets, which would appeal nearly to everyone. As for me it would seem quite logical if the company had included in the sales package of the PV-705 a USB-adapter to position it as an IP-telephony tailored solution. Especially in light of the fact that such kit could have been inexpensive and quite easy to run. Also this headset is literally crying out to be placed in one box with a handset. More precisely, its predecessor in the PV-line-up was promoted along with the company’s handsets. I should also notice that the comparison of the PV-700 and the PV-705 doesn’t make any sense, as these are completely different products having only their target audiences in common. Namely the customers who want to get a high-quality branded headset for not more than 50-60 USD. Physically the headset lives up to the bar as it is made of non-coated plastic, which basically excludes possibility of abrasion in course of day-to-day use. Unfortunately detaching the front panel of the headset is a tricky thing - although there is a hook there, I failed to get the panel off. The ear loop is monolithic here since in the middle there is no pivot point as that found on SE HBH-610, so you can change the ear without any troubles by taking off the band. 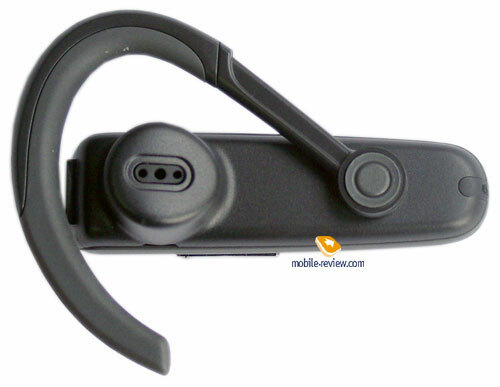 As you can see on the photos we tried out a headset in black, but other color schemes might materialize as well - for example on the company’s site there is a photo of the device with light bronze finished faceplate. Way of wearing the device with the help of ear loop is quite traditional; at least it seemed to me that the PV-705 is comfortable to have it on ear. On the inside the ear loop is covered with hard rubber, softening the touch. All in all, the headset is easy to wear – such cases as pain or inconvenience are rare and occur only for people with “complex” ears. In fact the PV-705 can be worn together with glasses as well, but everything comes down to the size of ear arms. Unfortunately the sales package of mine was not complete, so combined with the fact that the PV-705 lacks holes for a carrying strap, it’s still obscure whether its lanyard has the same design as the HBH IV-835’s one. The controls of the device are rather ascetic as they include multifunction button (pick/hang up key, switching between calls/voice dial/last number redial, also it’s used for device pairing) and a volume rocker switch. Buttons are pushed with barely audible, yet tangible click and are easy to get used to as they feel good to the touch and well laid-out. 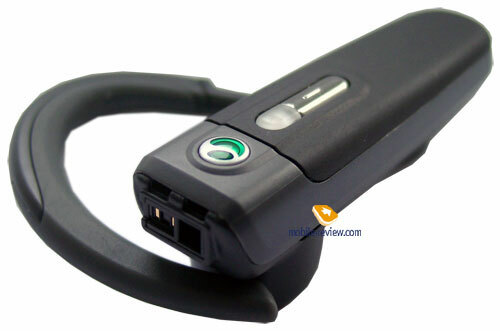 The LED mounted near the multifunction button triggers off with either red or green light not too often and bright, telling you what is happening with the headset. As it usually happens with SE-branded devices, we failed to find any information on the battery used. However it is likely to be a Li-Pol unit with yet indefinable capacity. The manufacturer claims the headset manages to provide talk and standby times of up to 12 and 300 hours respectively on a single full charge. I should draw your attention to the former figure which is extremely high. In practice the headset put up the following figures: it remained good for 5 days on average load of 20-30 minutes of calls a day and with two nights in offline mode. It sounds ridiculous, but with the PV-705 it’s not a big deal to forget about recharging at all - this device beats all other competitors lifetime-wise. 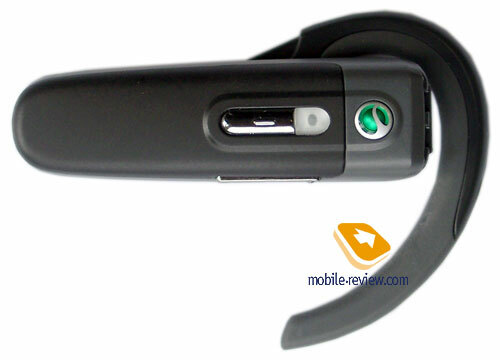 The headset retains halved FastPort slot, which will be greatly appreciated by the owners of up-to-date Sony Ericsson-branded handsets. 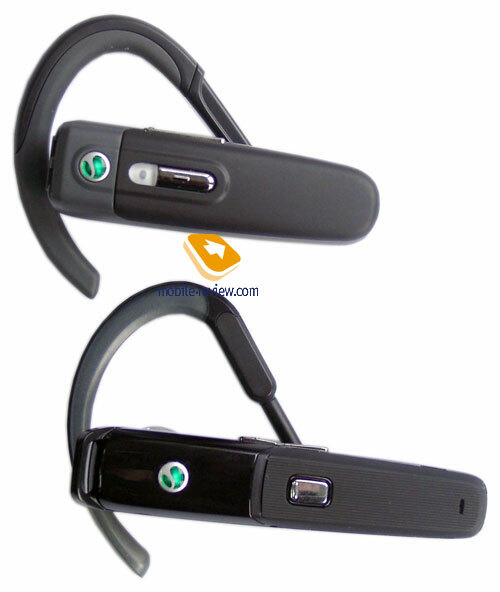 The headset was tested out with Nokia 5500, Sony Ericsson W900, Samsung D600. To enter paring mode you need to push the multifunction button and the both volume keys at the same time; so as you have to hold the buttons for some time the whole process starts looking like some kind of tightrope-walking. I suppose that causes extra troubles which could have been avoided easily. Both pairing and detecting the headset were a breeze for all handsets we used, this holds true for its main functions as well. It is strange, but the worst performance was put up in case with the W900 – personally, I don’t like pressing the pick up key on the phone on every coming call to confirm that I really want to use the headset for talking or wait for auto sound transfer to the PV-705. Nokia and Samsung didn’t bring about such troubles. 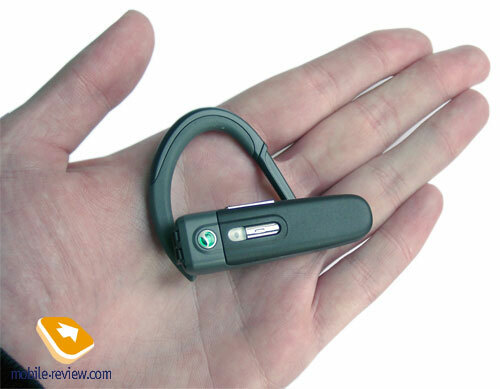 The sound quality is on a high level which is common for most of the company’s accessories. Although the PV-705 lacks DSP-processor, it doesn’t prevent you from talking in moderately noise-polluted places - you hear the interlocutor quite well even when music is playing close to you; the volume provided by the PV-705 is quite something, at the same time it’s obvious that there is no way one could get what you are talking in such noise. Increasing the distance between the headset and the phone up to 4-5 meters causes noise and makes parts of words go missing so the best thing to do is have the handset in a bag and the headset on your ear. Naturally, as you get closer to the handset, sound becomes more penetrating. To sum-up everything up, I have to mention again that the sound quality for this price-bracket is extremely good – pay attention to this parameter when you get to choosing a gadget. Sony Ericsson PV-705 undoubtedly benefits from having very portable dimensions, fairly good design, great lifetime figures on a single full charge and good speech transfer quality. It would seem strange, but the shortcomings are rather hard to find – I can think only of missing “specialties” that would boost the PV-705’s status, though seemingly no one over at Sony Ericsson set out to create something like that. So in a nutshell it’s an extremely good entry-level offering, whose price will be around 60 USD. 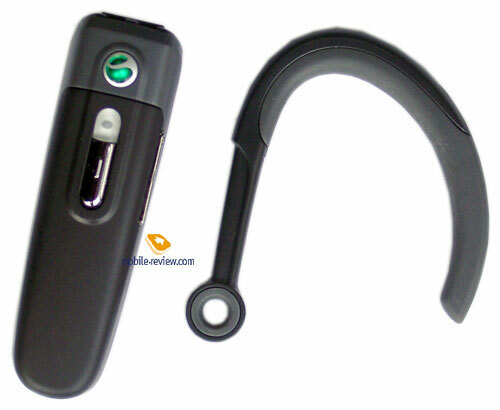 However its rivals are many, listing them all is quite challenging – these are solutions by Jabra, Nokia, Motorola, other not widely known manufacturers and finally products by Sony Ericsson itself. “Last but not the least” goes for Sony Ericsson on this list, as the HBH-610, while having slightly higher price, boasts a very attractive design DSP, Bluetooth 2.0. That is why the PV-705 is unlikely to be an evident sales hit in «below 60 USD» price-bracket – its design is nothing to shout about, after all (I guess those who have already seen the headset would agree with that). But shop-assistants should push through splendid lifetime (the PV-705 hasn’t got any rivals at all now) and good speech transfer quality. To my mind, reaching high sale rates won’t be a big deal in case these two greatest attractions will be highlighted “on-the-spot”.